Do you need a Visa when traveling to Myanmar? Except for citizens of countries in the ASEAN (Association of Southeast Asian Nations), tourists from other countries are required to apply for Visa when they want to enter to Myanmar. How is E-visa process working? The Government of Burma’s E – visa program allows tourists to apply for a visa online rather than physically applying at an embassy or consulate. The system is launched on 1 September 2014. E- visas are issued online for tourism within 3 working days. 90 days before from departure date, travelers can start to apply for the E-visa. Do not apply too soon because the E-visa is only valid and needs to be used within 3 months. The fee for a tourist costs US$50. The official Government Website for applying is evisa.moip.gov.mm. Be aware that non-official websites may be the scam. You have to upload one COLOR PHOTO (4.8 cm X 3.8 cm) taking during last (3) months. When arriving at the Airport/Check point, proceed straight to immigration counter. Tourists with E-visa don’t need to queue at Visa on Arrival desk. Present the E-visa approval letter and your passport to the Immigration officer and get the passport stamped. No stamping fees required. Address: 3/50F, Nyaya Marg, Chanakyapuri,, New Delhi, Delhi 110021, India- Phone: +91 11 2467 8822. Where to go in August in Indochina region? 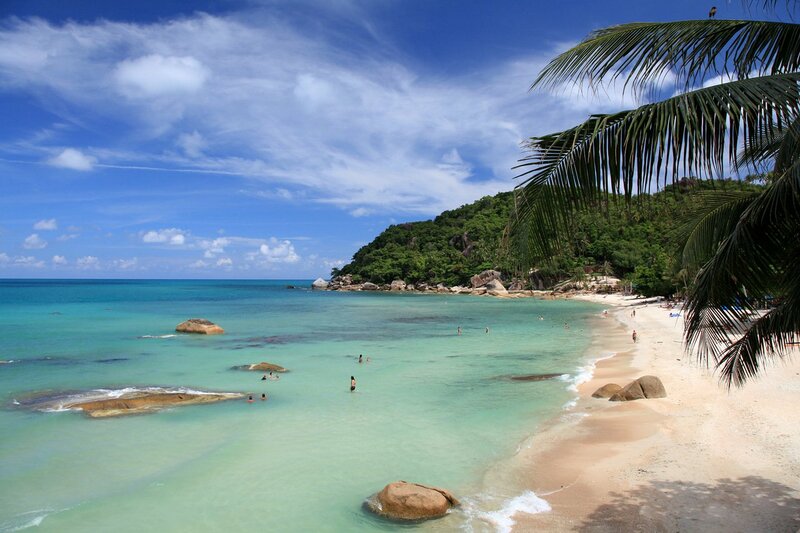 The beaches of Hoi An and Danang deserved in the list with good weather expected throughout the month. Average temperatures remain high at 30 °C and most of the days sunny and dry. Nha Trang is likely to be at its the best of the weather of the year with yellow sunshine, blue sky, and white sand that also at peak season of domestic traveling. Koh Samui in August is the right time, right place. Most days are long and generally sunny, with 29°C temperatures and a comfortable level of humidity between 61% and 88%. The wind is mostly from the west and stirs up a few waves on that side of Samui, making it good for sailing. The popular east-coast resort towns still enjoy placed 28°C, perfect for swimming with young ones on their summer holidays. Although the rainfall is almost at its peak, the showers tend to be short and intense, lasting for a few hours rather than all day. In the countryside, there is more lush and green, and water levels on the Tonle Spa Lake are high, making it possible to visit the flooded forests and floating villages by boat. The average temperature is a comfortable 26-27°C. Despite the wet weather all over in Laos, southern highlights of the 4000 Islands remain accessible by boat, with the region’s waterfalls (unsurprisingly) at their best. 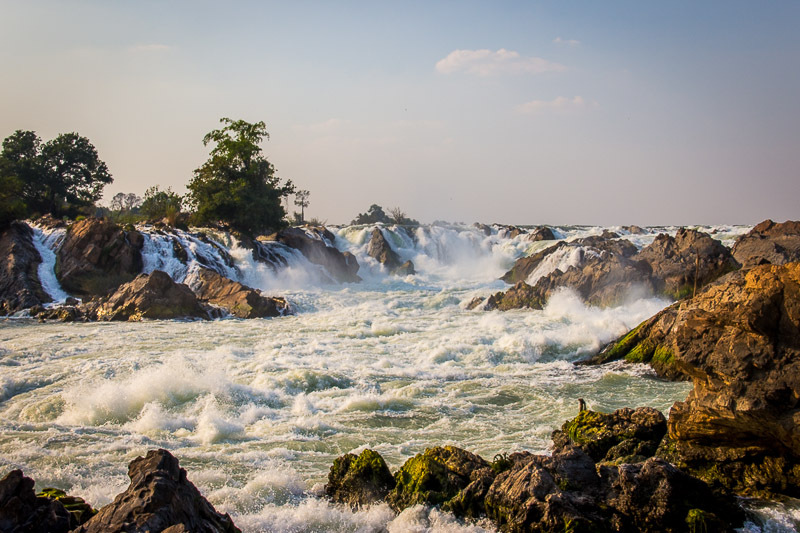 The Khone Phangpheng, the Mekong River biggest waterfall with stunning scenery is worth taking. The months of July – August often see sporadic hurricanes and storms, which may render cancellation and delay of your trip. In those cases, you can switch around by visiting another destination in the North of Vietnam and visit Halong Bay later (such as Sapa, Hoa Binh or Ninh Binh). These storms will not last longer than 3-4 days. However, the massive sales of cruises in low season is interesting for who doesn’t mind the weather. Rainfall across much of Thailand is at its peak in August, with Chiang Mai and the north typically receiving their heaviest rainfall of the year. In the more rural northern regions, such as Nan and Chiang Kham, the rain can make traveling around fairly difficult. Temperatures continue to drop slightly although humidity levels will remain high at average 26-30°C. High probability of rain and showers increasing in severity. Along with overcast skies, humidity levels can reach 85% in August and temperatures in Luang Prabang range from 25-30°C. In the more remote regions, such as Phongsali and Muang Sing the heavy rain can make traveling around fairly difficult and tracks may become unpassable, with the risk of landslides in some areas. If it’s ‘off the trail’ it’s best avoided in August. Rain can be expected almost every day on the islands of Koh Chang and Koh Kood, and the west coast beaches of Phuket, Khao Lak and Krabi will also be experiencing their wettest month of the year. In the more rural north-east regions, such as Ratanakiri and Mondulkiri the heavy rain can make traveling around fairly difficult and tracks can become unpassable. If it’s ‘off the trail’ then it’s best avoided in August. Rainfall will start to lessen towards the end of the month, however, wherever you travel in Myanmar you should expect heavy rains. Temperatures remain high (averaging highs of 27 – 30°C) and the beaches on the west and southern coast are now closed with road travel across much of the country difficult, in many cases impossible. Half of the boiling summer has gone in North Vietnam tours and I believe that you all have well enjoyed your beach relaxation for your summer vacation. It is about time to start to farewell the summer and welcome the most expecting time of the year: Autumn for stunning harvesting time of the year. If you have not popped up any ideas yet, let’s follow me with these beautiful golden rice places in North Vietnam, both in the delta area and the mountainous one. Tam Coc has long been famed as the enchanted site for a boat trip through the emerald waterway. From Hanoi, this is also the closest place among the sites that I would like to introduce which can be done within a day for only 120km. Though it is popular for many tourists to Vietnam but your trip is not fulfilled without visiting at the right time of harvesting season since early May each year. On the boat trip by the local boat men, you will be sailed from this surprise to the other excitement by the breath-taking scenery here. I guess you can’t keep your “WOW” when enjoying the yellow color of a huge natural carpet of rice in the summer breeze, the color of pure greenish-blue Yen stream and the blue cloudlessly shining sky. Also, the journey passing by imposingly ancient rock mountain that leads you to Ca, Hai & Ba limestone grottoes which are adorned with glistening stalactites will create an unforgettable picturesque scenery. If the photo shoots of harvesting rice season in the delta area is not enough for your passion, now we will move further to the mountainous area of Vietnam to indulge yourself in the amazing beauty of the national heritage site. Mu Cang Chai is a rural district in Yen Bai Province, 290 km away from Hanoi and is emerging as an ideal place for a large number of foreigners instead of only Vietnamese as before. To reach this heaven on earth, you will pass by the most dangerous pass in North Vietnam: Khau Pha Pass. No matter what time of the year you choose to travel here, there will always be amazing scenery to watch, but the best time to visit these beautiful lands is during the grain season from mid-September to early October when you will be absolutely thrilled by the majestic beauty of this golden sea of rice. There are three most attractive stops that can’t be ignored to catch the most mind-blowing beauty namely as: Che Cu Nha, La Pan Tan and De Zu Phinh villages. Looking down from the top of hills, tourists can see awe inspiring terraces fields stretching along the mountain side till the bottom of steep valleys that looks like streams and rivers, making it the natural masterpiece of giant rice staircases leading to heaven. Besides the amazing rice fields, you may also have chance to see a plenty of local life moments by H’mong & Thai ethnic peoples. The rustic lifestyle of these tribal people together with the breath-taking nature surroundings makes Mu Cang Chai one of the top destinations for any authentic experience lovers. Sapa, 350 km to the North West of Hanoi is always an attractive tourist destination all year round that can be undeniable: in winter, white snow falls (occasionally) covering mountains, in spring plum flowers blossom in the warm sunshine, in summer peaches are ripe and in autumn the rice blooms in sunshine. Unlike other places in Vietnam that can have two crops a year, there is only one crop per year in Sapa starting from June to October. Therefore, to see the most beautiful scenery in Sapa, tourists are highly recommended to come here when the rice fields are ready to be harvested with lovely smell of new rice since late August to September. In the ripe rice season, tourists can embark on the greatest trekking route along the Cat Cat Village, down the Muong Hoa Valley, go around the Lao Chai, Tavan Village or standing from the top of the mountain at Ta Phin Village for gorgeous golden grain fields and scattered stilt houses of H’mong, Red Dzao and Tay, Zay peoples. Nothing is more perfect than seeing the whole valley painted in various shades of green and yellow and dotted with bright colors of red or indigo of traditional costume worn by farmers working on the rice paddy fields. Why don’t you try it on for this autumn? Rice fields in Bac Son have been rated as “A rare green field of the planet” on the tourism website whenonearth.net for its amazing and unique features. The reason is that this valley owns incredibly high mountains which are about 500-1200 meters high. These mountains, together with the valley’s rice fields, create a great scenic landscape that you can only see its best after climbing on top of Na Lay mountain which is about 600 in height above sea level. From here, you are absolutely amazed by the stunning 360-degree scenery of mountains, villages, rivers and farms. The pristine beauty of Bac Son Valley also changes in different time of a day. In the morning, the valley becomes dim because of the thin layers of fog cover on the slopes of limestone mountains. At sunrise, smog disappears and the first beautiful sunlight begins to brighten up Bac Son Valley. At dawn, the sun gradually hides itself behind limestone mountains, which creates a wonderful beauty for this destination. After sunset, Bac Son Valley becomes more sparking by the light of daily schedule in houses on the foot of limestone mountains. At any time, Bac Son Valley also offers a taste of tranquility and serenity for visitors’ soul. Hoang Su Phi of Ha Giang Province is one of the most spectacular but least-travelled areas in northern Vietnam (300 km from Hanoi) – with mountains covered in lush rice terraces. The harvesting time of Hoang Su Phi is a little later than in Sapa or Mu Cang Chai, from September to end of October is the best moment for photographers. Beautiful rice terraces are stretching along this area but the best place to have the nice shoots is Nam Ty, San Sa Ho, Ban Luoc, Thong Nguyen. The rice tree itself is taller than in Mu Cang Chai and the terraces is also at higher altitude. These rice fields are not only a highlight to atract tourism, but are the home and the food supply for many of Vietnam’s ethnic minorities like Mong, La Chi, Dao and Nung, giving it a diverse appeal. Though the system of rice cultivating is somewhat traditional with simple tools, the aged-old knowledge of taking care of rice fields has maintained its fertile ground artfully, making Hoang Su Phi become the most wanted site for dream explorer and an ideal destination for hiking tours, trekking tours and photography tours with homestay experience at local houses of the hill tribes. It is not superlative to call Hoang Su Phi the magnificent work of local people. Due to the different period of rice planting, the harvest time is varied among places that noted clearly above for each site. Therefore, choosing the right time will bring you a collection full of colors: from lust green to dark yellow and even the dark brown color. Choose suitable clothing when traveling to the rural mountainous area, including thin jacket, walking shoes and hat to keep your greatest physical condition. Do not forget to prepare your battery and backup memory card as the photo chance is endless. Choose the colorful clothes and scarf to make you beautiful in any moments. Be respectful to the local culture. Bring along some snacks and candies for you and for kids and never spoil them by giving money. Ask the locals for their advices on the best spots for sightseeing and you may have off-the-beaten-track that you will never know. Now more than never, do not hesitate to take a trip to Vietnam’s Northeast and witness the art and beauty of the most wondrous rice fields in the world. Wish you the best harvesting season in Vietnam trip! Sin Ho – the rooftop of Lai Chau province. When you look at the S-shape map of Vietnam, the highest spot in the North West area which is marked by a red dot is Sin Ho, Lai Chau province. Lai Châu Province is unlike any other area of Vietnam. Not only is it the most sparsely populated are in Vietnam but it was also once a semi-independent White Tai confederation known as Sipsong Chu Thai. This was absorbed by France into French Indochina in the late of 19th Century and subsequently became part of Vietnam following Vietnamese independence in 1954. This is reflected in the great cultural diversity seen today. Lai Châu has long been the poorest province in Vietnam and also the least developed. The scenery of some of the most stunning sceneries you can see in all of Vietnam. The epic limestone mountains stretch out in every direction, many are lined with ancient forest, valleys are planted with rice, corn or neat little tea plantations. Located 60 km west of the town of Lai Chau, Sin Ho has the north border next to Yunan – China, the south is Tua Chua district, the east is Phong Tho district and the west is Muong Te district. If you have a chance to wander around by motorbike, it is even a more amazing and unforgettable experience to see the rice terraces or to catch a glimpse of the “cloud sea” in sunset/sunrise. Beside the spectacular views of the mountainous area, the highlight of Sin Ho is the weekend local market. Most of the local residences living around the town will join in the Saturday market, but Sunday is more attractive as it seems plenty of hill tribes from other villages gather here such as Red Mong people from Mo Village, Dao people from Phang Xo Lin Village or Phu La people from Pu Sam Cap town which is located quite far from Sin Ho and takes nearly one day for transporting. They come here to sell and exchange handmade goods with the traditional bags behind their back. This market is colorful with the unique dresses, delicious and authentic food presented each ethnic minority. Over the recent years, Sapa is seemingly becoming worldwide known for its beauty and diversified culture which lead to the fact that a lot of travelers wish to explore here. With aim to guide guests to another similar but less touristy destination, I am thinking of putting Sin Ho to our classic itinerary. That would be really unique! Firstly, you need to catch a night train to Lao Cai as the normal way to travel to Sapa then start the tour in the morning. However, it is highly recommended to be on the train on Thursday night then you will be able to see the market on Sunday.